Do orchardgrass, fescue or legume/grass combinations produce more meat on growing, pastured beef animals? Do beef steers, beef heifers or dairy steers show the most gain on pastures? Researchers in the departments of Animal Sciences and Agronomy at UW-Madison recently finished a three-year study to answer these questions. Pasture forage treatments included non-endophyte infected tall fescue, orchardgrass, soft-leaf tall fescue alone and soft-leaf fescue interseeded with kura or white clover. Soft-leaf fescue varieties were free of endophytes as well. Each treatment was established in two to three pastures, each 5.6 acres, divided equally into eight paddocks. Animals were rotationally grazed with paddock duration being two to four days, depending upon the season. Mineral supplement and water were provided free choice. Cattle grazing the clover pastures received poloxalene in their mineral to reduce the incidence of bloat. Animals were turned into pastures starting in late April or early May of each year and grazed until October or November. The experiment was performed at the Beef Cattle Research and Teaching Center at the UW-Madison Arlington Agricultural Research Station. Support for this project came from a grant from USDA-CSREES. During 2005, 2006 and 2007, three different types of animals grazed the pastures: crossbred beef steers, crossbred beef heifers and Holstein steers. Each animal weighed approximately 600 lbs when turned out to grass in the spring. Stocking rates varied; animals were added or removed from pastures based on visual assessments of forage availability. The total number of animals involved in the research varied from 125 to 200 head. Each pasture included equal numbers of beef steers, beef heifers and Holstein steers. “We wanted to compare the performance of dairy steers with that of conventional beef genetics. Dairy steers are an easily available resource in Wisconsin and may have great value as a stocker animal,” said researcher and project leader Jeff Lehmkuhler of the UW-Madison Animal Sciences department. Marcelo Ramos, a research assistant overseeing the project, collected numerous samples to monitor forage quality and availability, estimate pasture intake, track forage productivity and study the changes in the amount of clover in the stand over the grazing season. The main purpose of this research was to investigate animal gain on a variety of alternative forages. Wisconsin farmers who graze livestock likely prefer orchardgrass to fescue in their pastures. This is because many fescues are infected with fungi, or endophytes, that are associated with poor cattle performance. Results suggest that, when it comes to gain per unit of land, orchardgrass doesn’t perform as well as endophyte-free fescues and legumes. In 2005, the animals on the tall fescue pastures gained the most weight per unit of land (i.e. pounds per acre) compared with the other pasture forages. Kura clover interseeded with soft-leaf fescue and soft-leaf fescue alone were close behind. (The mix of white clover and soft-leaf fescue was not measured in 2005 or 2007, due to severe winter damage.) The animals on the orchardgrass pastures showed the lowest rates of gain in 2005 due to lower productivity and subsequent carrying capacity. This was not unexpected, as tall fescue in small plot trials has routinely outyielded orchardgrass. The 2006 grazing season was the best of the three years. “Precipitation helped us a lot during 2006, as 2005 was the driest year in the station’s recorded history,” observed Lehmkuhler. 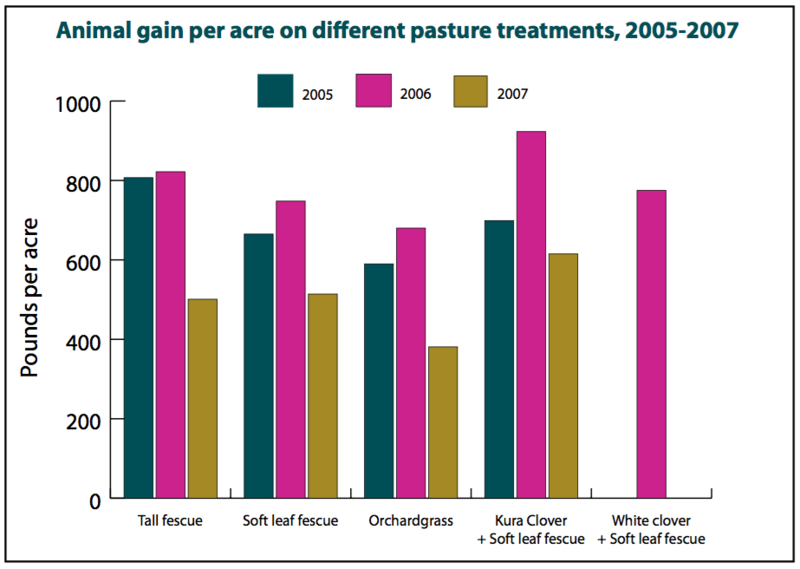 Kura clover pastures produced the highest gain per acre in 2006. “This did not surprise us, as our previous research has shown that kura clover has the potential to be a very productive legume when seeded with the correct grass,” said researcher Ken Albrecht of the Agronomy department. Weight gain on the other pasture combinations, with the exception of orchardgrass, exceeded 700 lbs per acre. Production was surprisingly low in 2007. “We had high expectations that we would exceed 1,000 lbs/ acre of gain during this season,” said Lehmkuhler. The reasons for the lower gain are not clear; however, several small changes were made in the research that likely added up to lower gains in 2007. Higher stocking rates were used, animals were slightly heavier at turnout, cattle did not receive an implant and parasite control was not as intensive as in the previous two years. Forage quality values were also lowest in 2007. Individually, all of these factors can reduce animal performance slightly. Kura clover pastures with no nitrogen application produced the same amount of gain as pastures of tall fescue and soft leaf fescue which received nitrogen fertilizer. “It is very important, both from an environmental and economical standpoint, to be able to demonstrate this ability to produce without added inputs, especially as N fertilizer continues to increase in cost,” says Lehmkuhler. 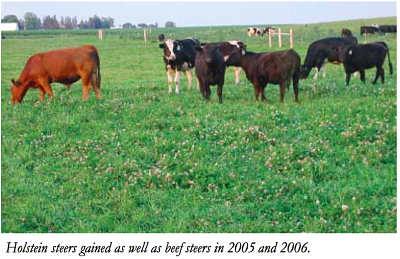 During the 2005 and 2006 grazing seasons, Holstein steers gained as well as beef steers. Both types of steers gained more than the beef heifers. In 2007, performance was nearly 50 percent of that observed the previous two years due to factors discussed above. Additionally, for unknown reasons, Holsteins performed worse than the beef steers in 2007. Good Holstein steer performance in 2005 and 2006, however, demonstrates that these animals are valuable when used in a grazing system and nearly a decade of information from the Lancaster research station illustrates that Holsteins achieve gains of 1.75-2.25 lbs per day on pasture alone. This Research Brief is part of a series. 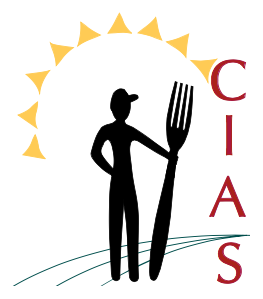 Contact CIAS for other titles. CIAS staff members are grateful for the reviews of this research update by UW-Madison and UW-Extension faculty and CIAS Citizens Advisory Council members.